Mohammedan Sporting coach Sudip Sarkar: Games like this build character! Home / Indian Football / Second Division League / Mohammedan Sporting coach Sudip Sarkar: Games like this build character! 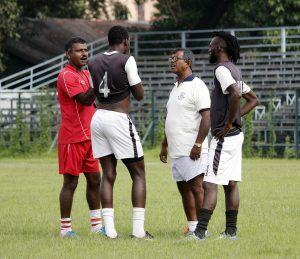 Mohammedan Sporting Club coach Sudip Sarkar is looking forward to their Calcutta Football League – Premier Division ‘A’ clash with East Bengal on Tuesday at the Saltlake Stadium. “Playing against the biggest sides in the competition is always exciting because that’s where players really get the opportunity to test themselves individually and as a collective,” Sarkar said. The former national goalkeeper has also acknowledged East Bengal’s stature. “East Bengal are a huge team, and we respect them. But we have to do what we do best,” adds gaffer. “We need to deliver for the fans. Games like this build character,” he concluded. East Bengal are unbeaten in their last three matches against Mohammedan Sporting, who will be looking to break that record. History shows that East Bengal have dominated this encounter from 2015/16 as the last time Mohammedan Sporting won a derby was in the 2014/15 season courtesy of an Imran Khan’s solitary goal. Previous World Cup winner Andre Schürrle scores the winner in Fulham FC’s 1-0 win over ATK!